It is my pleasure to introduce the new Local of the Month: AEGEE-Tübingen! This month we like to honour an antenna really deserving this nomination because of their great effort in organising a series of lectures about conflicts in Europe, tackling human rights, medical treatment of migrants, education, and cultural diversity. In cooperation with other student associations they discussed how they can motivate people to become active in politics and non-governmental organisations (NGOs). A series called “Crises, conflicts and live together in one world” took place in the autumn semester 2011/2012 and distinguished speakers from business, politics, and science took part in debates. For instance one of the topics debated was “Borders of the EU – Borders of Human Rights? Integrationprocesses and conflict management on the example of Cyprus”. How many members does AEGEE-Tübingen have and when was it founded? We were about 15 members, but only about ten are active. AEGEE-Tübingen was founded at the Spring Agora Bucuresti 2003 where we signed the Convention d’Adhesion and became a Contact Antenna. We organised our first Summer University together with Stuttgart, Mannheim and Konstanz in July 2003. Can you describe AEGEE-Tübingen in three words? Why did you come up with the idea to organise an event about international conflicts? What did you want to achieve? 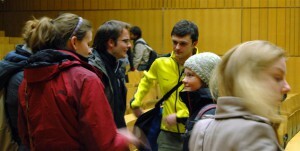 In Tübingen there are many small, but active student groups. We met and thought about our common aims. It turned out we all fight for peace and stability in different ways. Every semester there are lectures which are open for all students as well as any other person in Tübingen and supported by the university. These lectures are called “Studium Generale” in Germany. We wanted to organise lectures by students to inform more people about our student groups, about what we do and to inform about the topics we are working on. Do you consider it a success? We had about eight different lectures and one panel discussion. Every lecture was attend by 50 -150 people. The different student groups in Tübingen sat together and learned from each other. They now know what the other associations are focusing on. So yes, I think we can call it a success. Would you like to do a similar discussion round again? 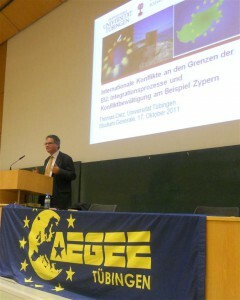 Did anything change for AEGEE-Tübingen after the Studium Generale lectures? Did more people become aware of AEGEE in Tübingen and the work you do? I got some e-mails with questions about the lectures, AEGEE in general and about the lecturers, but unfortunately we didn’t attrack any new members through the lectures. However, after such lectures people go home with new information. You never know what they gain from it, which lesson they have learnt and what information they will spread to others. What was the last AEGEE event you organised? 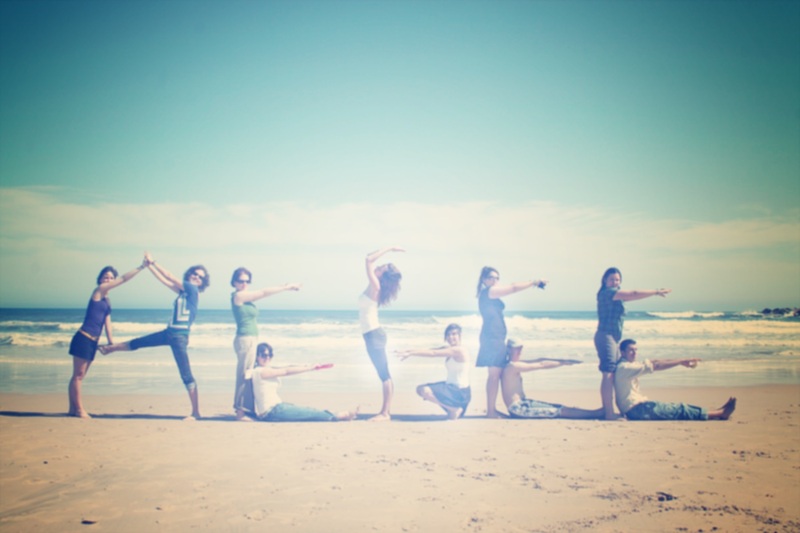 Our last international event was the Network meeting “Tü be or not Tü be” from 8th to 10th April 2011. We also organised a trip to Strasbourg, arranged a Swedish evening for our local members and friends, had a trip to the Christmas market in Esslingen and did lots of other things. What should the network know about AEGEE-Tübingen? Tübingens’ strengths are its very different members – members from many different faculties (physics, biology, medicine, economics, IT, politics, linguistic, cultural studies etc.). We are small, but active. For a small and rather new local such as ourselves, a more centralised structure within AEGEE would be helpful. We reinvent websites, programmes, advertisements, and people constantly work on organising themselves. The time spent on this can be spent on working on the Fields of Action. In our local it is difficult to find people who commit for a long time, for example for the position of president. Ever since the Bologna system has been introduced in Germany, it is easy to find people for projects, but it gets harder to find people for a long-term commitment. Thank you very much for this interview, Jan-Philipp! After the interview, AEGEE-Tübingen sadly confirmed that they asked to be deleted at the Agora Enschede 2012, because they cannot find any active people who like to become board members. Therefore, thank you AEGEE-Tübingen for this wonderful nine years in our Network! We will not forget you!